I wanted to revisit Matt’s post on the 20 Best Xeriscape Plants for Colorado, and add to his list of great low-water plants for Colorado landscapes. As with Matt’s initial posting, this list of plants also offers a great variety of color, texture and form for your water-wise garden. Consider adopting some of these amazing plants into your landscape, and tell all your friends about the benefits and beauty of drought tolerant plants. Chocolate Flower – Berlandiera lyrata An intoxicating chocolate scent emanates from the yellow blooms of this low water southwestern wildflower from summer into fall. Whirling butterflies – Gaura lindheimeri Whirling Butterflies truly lives up to its name. Growing 2-3’ tall by 18-24” wide, this perennial has a significant bloom time, sporting multiple flower stalks that whirl numerous small white flowers in the late summer breezes. Creeping Veronica – Veronica spp. A spring blooming favorite, creeping veronicas are somewhat adaptable to light and moisture conditions. The deep green foliage is often evergreen in winter and makes a nice backdrop to the abundant light blue to purple flowers that arrive in April. Sweet Woodruff – Gallium odoratum No dry shade garden should be without this fabulous groundcover. If you have a dry shady spot under a tree, this is the plant for you. It is said that sweet woodruff is one of the few plants that will flourish under the shady canopy of evergreen trees. Small bright green leaves become decorated with tiny white flowers in late spring. Orange Carpet Hummingbird Flower – Epilobium canum garrettii If hummingbirds pass through your area consider this California native. It provides a stunning orange floral display in late summer that hummingbirds love, and is ideal to let cascade down a rock wall. Blanketflower – Gaillardia aristata Related to sunflowers, this is another North American native that is a great addition to the low-water garden. It blooms from June to September with flower petals that transition from yellow to orange to red. Many cultivars available. Easy to start from seed. Silvery Horehound – Marrubium rotundifolium This native of Turkey is a great xeriscape ground cover. It grows 2-4” high and 2-3’ wide. Soft white hairs on the round leaf margins add an effulgent look to the plant. Hens and Chicks – Sempervivum spp. This familiar garden succulent from Europe is a hardy performer that will grow just about anywhere. Great for the small spots between other low perennials or rock gardens in full sun. Another nice benefit is how easy it is to transplant the offshoots they provide. Several types are available, with some covered in charming white hairs. Sunrose – Helianthemum This hardy low-growing perennial provides a delightful floral display starting in June. The profuse blooms hover over a thick mass of low branches that carry small, oval shaped leaves. The flower color is available in shades of red, orange, yellow, pink and white. Perfect for a rock garden or a hot and sunny border area. Blonde Ambition – Bouteloua gracilis ‘Blonde Ambition’ This is a wonderful medium sized grass, 30-36” high and 30-36” wide. It provides multiple seasons of interest, showcasing the classic blue grama grass curled seed heads well into winter. ‘Undaunted’ Ruby Muhly – Muhlenbergia reverchonii A 2014 Plant Select introduction. Discovered by Lauren and Scott Ogden, it hails from Oklahoma and Texas. The inflorescence (aka flower cluster) is composed of clouds of tiny pinkish flowers, creating a pink glow with back lighting. Currant – Ribes spp. Currants are medium sized shrubs that grow well in sun, and some species also grow well in filtered shade. This is a notable fact, as many shrubs that do well in part shade require more water than the currants do. Some species provide edible fruit, and some have fragrant flowers. The most notable fragrant currant is Crandall Clove Currant, whose flowers do indeed smell like cloves. Dwarf Russian Almond – Prunus tenella Native to Eurasia, this flowering shrub is said to be hardy to zone 2!!! Abundant with pink flowers in the spring, one disadvantage of this shrub is the aggressive suckering habit which may make it hard to control, but this also makes it an attractive cover for wildlife. Size is 3-5’ x 3-5’. Dwarf Pinyon Pine – Pinus edulis This slow growing selection of pinyon pine was introduced by Plant Select in 2014. Grows 20-30” height by 20-30” width in 10 years. Mohican Viburnum – Viburnum lantana ‘Mohican’ Another great low water shrub that does well in either full or part sun, this viburnum grows 6’ by 6’. White flowers in spring precede orange to red fruits that darken to black in fall. Mountain Mahogany – Cercocarpus spp. This western native is indispensable if you’re planning on creating a large native style landscape. Some species are semi-evergreen and one species Cercocarpus montanus the leaves turn a nice russet color in fall. Seeds provide a charming fuzzy appearance that looks great when backlit. Peashrub – Caragana spp. A tough shrub from Siberia and China, the peas shrub is, just as the name indicates, related to peas. It produces edible (but not palatable) pods and edible yellow flowers that interest to salads. There are several different species and cultivars to choose from, which range in size from medium to large. Bigtooth Maple – Acer grandidentatum Native to the inter-mountain West, and closely related to the sugar maple. Often growing as multi-stem, it likes full sun to partial shade and low to medium water. The samaras, or winged seeds turn rose color in late summer, and the fall foliage ranges from yellow to red. Grows 20-30’ high by 20-30’ wide. 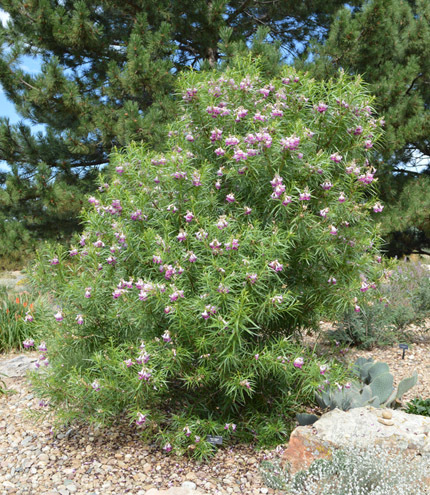 Desert Willow – Chilopsis linearis Another typically multi-stem small tree, it is hardy to zone 7 (0 to 5 deg F), but usually survives Denver winters, dying back to the ground each winter, and quickly sprouting new growth each summer. If given a sheltered spot, it may not die back to the ground. Distinctive pink to burgundy flowers with yellow throats. Drought tolerant, with watering being deep and infrequent. Grows 6-30’ high by 6-30’. Hawthorn – Crataegus spp. These flowering trees are cousins of roses, and bloom in spring with clusters of white flowers that produce long lasting red fruits that offer winter interest. Several species and cultivars have thorns on the branches. Grows 15-25’ high by 15-25’ wide, depending on species and cultivar. – This list is for the Front Range of Colorado. We are somewhere in the middle of zone 4 to 5 on the USDA Plant Hardiness Zone Map. – I have only included plants that are very easy to care for, and have excluded plants that require a lot of water since that is a key component of Xeriscape. The “best” plants, in my opinion, are those that are well adapted to the local climate and do not require much additional water and maintenance. Of course there are occasions where the use of higher water-use plants is desirable, such as in drainage areas, however I have left them off of this particular list.